We last talked about knowing where your dollars were going when developing a marketing budget; now we’re going to shift the focus to where your money is coming from. Pricing is one of the most important aspects of your business. Prices determine the revenue stream for your business and must be sufficient to cover production costs, company overhead and yield a profit. How do you come up with a pricing model with the ability to attract customers and keep your business thriving? A useful way to determine accurate prices is having a competitive pricing strategy in place. Competitive pricing is charging a price for the products or services you offer that’s comparable to other businesses within your market or industry. 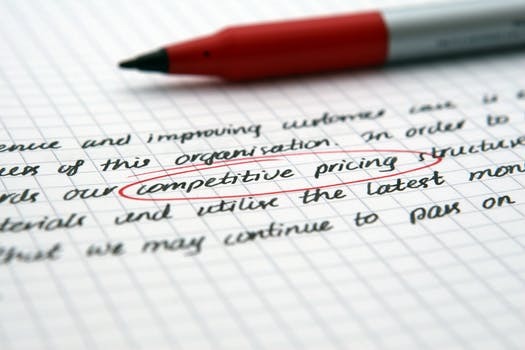 To get a good understanding of how a competitive pricing strategy can benefit your business, let’s first look at a common mistake some businesses make when coming up with their prices. Then, we’ll examine how to effectively implement a competitive pricing strategy. One of the most common mistakes we see businesses make is taking a quick glance at a couple of competitors and subsequently setting their prices lower. Although it may seem this will draw potential customers away from competition, it often hurts rather than helps businesses. Intentionally setting your prices low may lead to a devaluation of your products or services and creates a perception that it’s cheap. Low prices can also hinder your business from moving forward. Setting prices lower than your competition doesn’t mean you won’t succeed. Failing to do comprehensive research of competition’s pricing and comparing it to the sustainability needs of your business, however, isn’t a good idea. When you set your prices at the benchmark level set by your competition, it puts customers in a direct comparison situation. When done correctly, you can make this work to your advantage and possibly attract customers away from competition. When your product or service is offered at the same price as a competitor it presents the opportunity to focus on the differentiating factors of your business. Having a reputation for stellar customer service and satisfaction could persuade a customer to choose you over a competitor. Having lower prices can appeal to prospective customers, but it also puts you at risk of not making enough or even losing money. If having low prices is something you want to aim for, you must have a well-thought-out strategy that acknowledges production costs and how much money the business needs to make to stay in business. The final option is to set your price point slightly above your competition. This sets expectations high in terms of the level of service or product features, so it’s imperative you’re capable of delivering. If not, you risk losing a significant consumer base to competitors. It cannot be emphasized enough how important pricing is to the overall success of a business. Developing a smart strategy for pricing that sets you up to be a relevant player in your industry is equally important. Are you concerned the current pricing of your product or services isn’t creating the revenue stream your business needs? Please contact us today. Helping businesses achieve confidence in managing their numbers is something we’re passionate about!